Shopping for a new Ford Fiesta? The 2019 Ford Fiesta ST delivers go-kart thrills in a city-friendly package for not much money. The 2019 Ford Fiesta subcompact sedan and hatchback vies for buyers on a budget, but they’d better act fast. Ford will phase out the Fiesta during the 2019 model year and sell only crossovers, SUVs, and pickups in the future. The Fiesta comes in S, SE, Titanium, and decidedly sporty Fiesta ST trims. 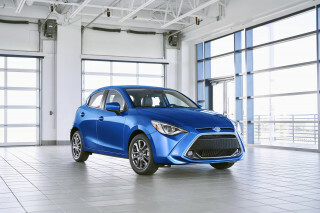 The first three use a 120-horsepower inline-4 paired to manual and dual-clutch automatic transmissions, while the hatchback-only ST has a zesty 197-hp turbo-4 mated to a slick-shifting manual transmission. Most Fiestas leave the factory with the dual-clutch automatic, which can be balky at low speeds. With its European-oriented suspension, the Fiesta has a firm ride and quick, responsive handling. Ample road noise and twitchy highway stability make it a wearing long-distance cruiser, however. The Fiesta ST turns things up to 11 but its turbo-4 rarely overwhelms its front wheels. It’s a shame that the Fiesta ST’s strong powertrain and willing platform are wrapped up in a dated body. The narrow interior ensures that even slight front seat passengers will brush shoulders and the rear seat is decidedly tight, but the Fiesta hatchback has surprising utility. The button-heavy dashboard can be cumbersome to sort through, although the Fiesta’s available 6.5-inch touchscreen for infotainment is a bright spot with its Apple CarPlay and Android Auto compatibility. The Fiesta earns the right numbers for its fuel economy, but the wrong ratings for crash safety. It lacks the latest active safety tech standard on some rivals and its crash-test ratings don’t impress. The 2019 Ford Fiesta is curvy but confused inside and out. Most Fiestas have a chrome-heavy grille with horizontal bars that ties the small car in line with Ford’s larger Fusion sedan. The similarities end there, however. The Fiesta hatchback’s long roofline carries into a neatly truncated tail. Fiesta sedans look tall and narrow, even though their dimensions are about the same as hatchbacks. Ford tosses typical go-fast styling upgrades to the Fiesta ST: bigger wheels, blacked-out trim, and a body kit. Inside, the Fiesta’s dual-cowl dashboard puts audio controls up high, with climate knobs and buttons tucked low. Cars fitted with the standard 4.2-inch screen have myriad buttons, kind of like the flip phones that were in most owners’ pockets when this design hit the road a decade ago. The optional 6.5-inch touchscreen for infotainment works well but looks like the afterthought that it is. Fiesta STs have their own upholstery trim and they can be fitted with grippy Recaro seats. The 2019 Ford Fiesta can be a hoot to drive, but you’d better select the right options. Fiesta S, SE, and Titanium trims use a 1.6-liter inline-4 rated at 120 horsepower. A turbo-3 was briefly on offer but didn’t prove popular with consumers. 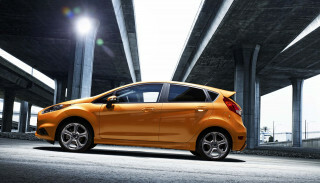 The base engine is smooth and provides enough power to help the lightweight Fiesta keep up with traffic. The standard 5-speed manual is a gem, but the dual-clutch automatic transmission fitted to most Fiestas can be jerky at low speeds and often feels confused. Even the base Fiesta S has a good driving position with a chunky steering wheel that fits its sporty demeanor. It relishes zipping down a winding road. Its ride is firm but composed, although a short wheelbase means the Fiesta can be choppy on some pavement. The Fiesta ST uses a 1.6-liter turbo-4 that cranks out a healthy 197 hp, a lot of power for a car that’s well under 3,000 pounds with a full tank of fuel and a driver aboard. The Fiesta ST thrills on a curvy road, but it’s only available with a manual transmission and thus has a limited appeal. Torque vectoring up for the front axle ensures that the Fiesta ST’s power doesn’t overwhelm its chassis. It never forgets that it’s a front-wheel-drive hatchback, but that’s part of this small car’s rorty charm. The 2019 Ford Fiesta is pint-sized inside, even for a subcompact car. It doesn’t take an advanced degree in mathematics to realize that small cars don’t offer Escalade space inside. Even then, the 2019 Ford Fiesta is a tight fit for humans and their gear. The 2019 Fiesta’s front seats look more comfortable than they are. Even after a short ride, their limited support will have most drivers yearning for a stretch break. The Fiesta is narrow, which means that drivers and passengers will likely brush shoulders. Rear-seat accommodations are fine for kids but almost impossible for adults. The Fiesta doesn’t redeem itself when it comes to cargo utility, either. Sedans hold just 12.8 cubic feet of luggage in their trunks, and hatchbacks are only marginally better at just over 14 cubes. The Fiesta ST is even tighter at a mere 10.1 cubic-feet of cargo capacity. While the Fiesta ST has nice trim on its seats and door panels, most models leave the factory with cheap-feeling fabrics. In all, the plastic trim has a curious graining pattern that doesn’t hide how thin some materials are. The 2019 Ford Fiesta lags when it comes to crash-test scores and active safety tech. Most automakers don’t skimp on safety when it comes to their small cars, but the 2019 Ford Fiesta is a notable exception. No collision-avoidance tech is on its options list and both the IIHS and the NHTSA list some concerns with its crash-test performance. The 2019 Fiesta comes with a full complement of airbags, stability control, and a rearview camera, but most of that is federally mandated now. What it lacks is any tech to avoid collisions: The Fiesta offers no automatic emergency braking system, blind-spot monitors, or active lane control. 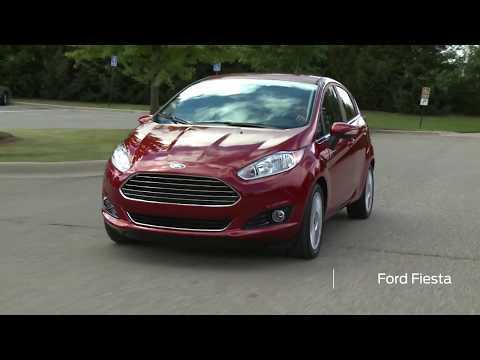 Ford’s subcompact is one of few new cars to not offer any of those features. The NHTSA rates the Fiesta at four stars overall, in part due to a rear door panel that it said struck a crash-test dummy in side-impact testing and could cause thoracic injuries. Independent testers offer a similarly bleak assessment. While the Fiesta earned “Good” ratings in most of the IIHS’ tests, it scored a “Marginal” rating in the driver-side small-overlap test. 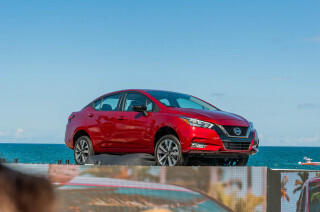 The 2019 Ford Fiesta can be well-equipped, but base models are spartan. The Fiesta S costs about $15,000 to start, but it’s often discounted. For that money, buyers get a 4.2-inch display for its AM/FM/CD/Bluetooth audio system, air conditioning, and not much else. The Fiesta hatchback costs about $500 more. For about $1,200 more, the Fiesta SE includes features such as power windows and locks, alloy wheels, and cruise control. It’s also the gateway to niceties such as heated seats, a power moonroof, and a 6.5-inch touchscreen for infotainment with Apple CarPlay and Android Auto compatibility. With the infotainment upgrade and heated seats, the Fiesta SE hatchback costs about $18,000—and, again, discounts are common. It’s the trim we’d select. The Fiesta Titanium adds leather upholstery, Sony speakers, and automatic climate control, but at more than $20,000, its value is dubious. 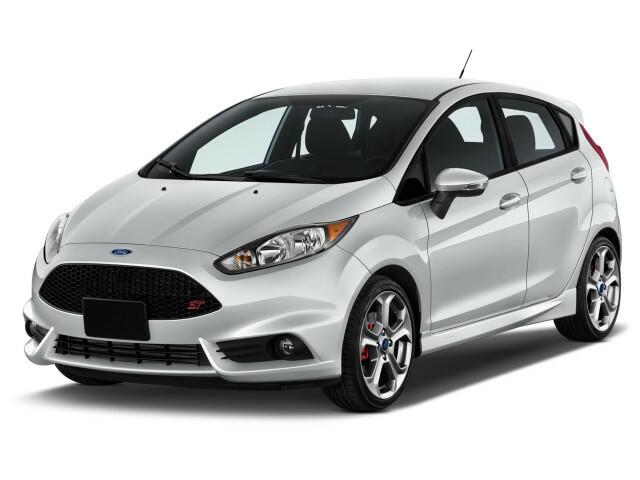 Available only as a hatchback, the Fiesta ST costs about $22,000, but it has the performance to match. Its available Recaro seats cost a hefty $2,000 and may not fit all physiques, so we recommend trying before buying. 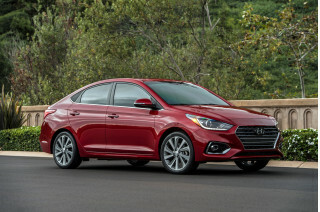 The 2019 Ford Fiesta sips fuel, but some subcompacts are thriftier. Compared to most new cars, the 2019 Ford Fiesta is a miserly choice. Compared to other subcompacts, it’s surprisingly thirsty. Those versions are rated by the EPA at 27 mpg city, 37 highway, 31 combined. 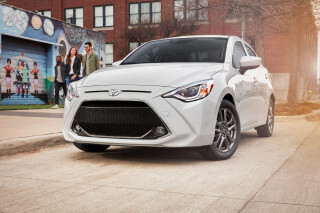 Opting for the 5-speed manual drops those figures to 27/35/30 mpg. The Fiesta ST provides a lot of smiles per mile, but it’s a bit of a guzzler for a small car at 26/33/29 mpg. 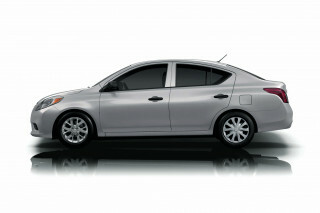 Some competitors such as the Honda Fit and earn as high as 40 mpg on the highway on the EPA’s test. Looking for a different year of the Ford Fiesta?